I am a big proponent of using Personal Kanban for personal work management. It is an effective technique that allows people to visualise their tasks and limit their work in progress. 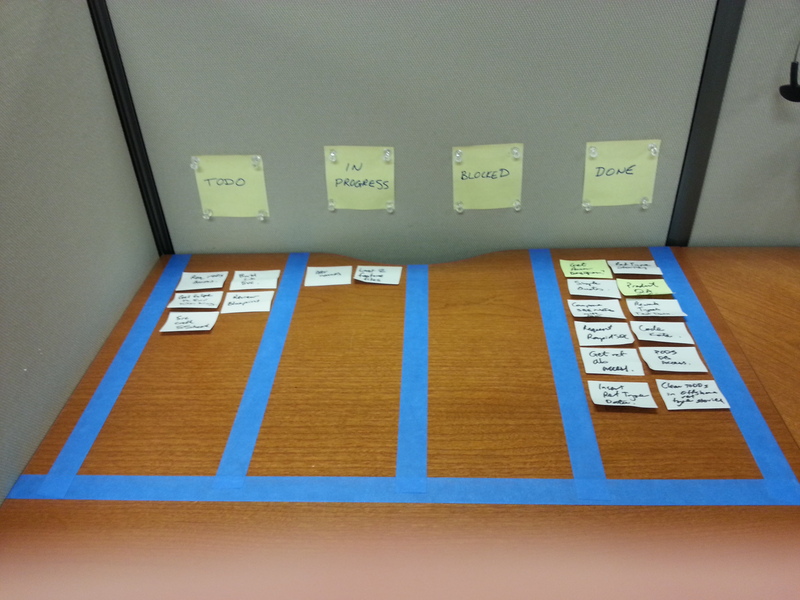 I’ve used Personal Kanban for the last three years in both my professional and personal life. 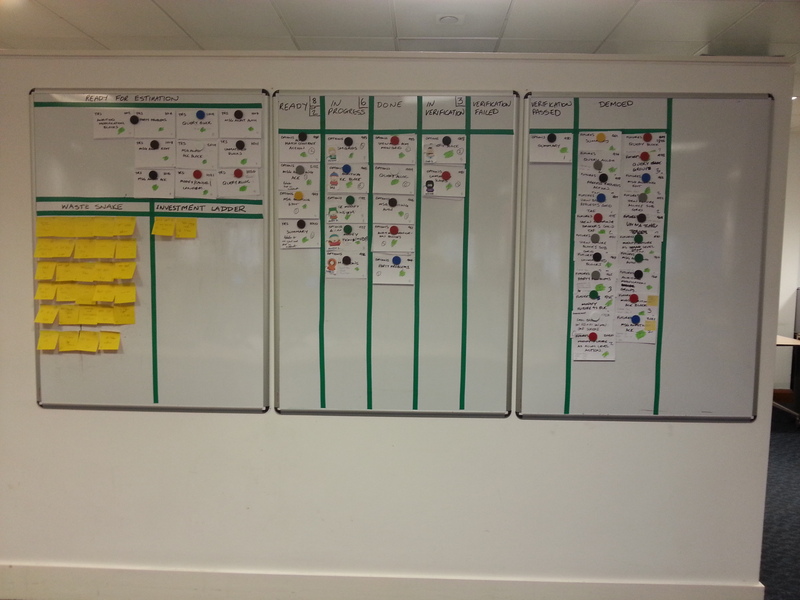 While I have used various online solutions to create my Personal Kanban boards I prefer to use a real physical board. The visibility and tactile interactions of a real board cannot be beat by even the my most convenient app, mobile or otherwise. Over this time I’ve snapped a few pictures of the various boards I have put together which I present here. 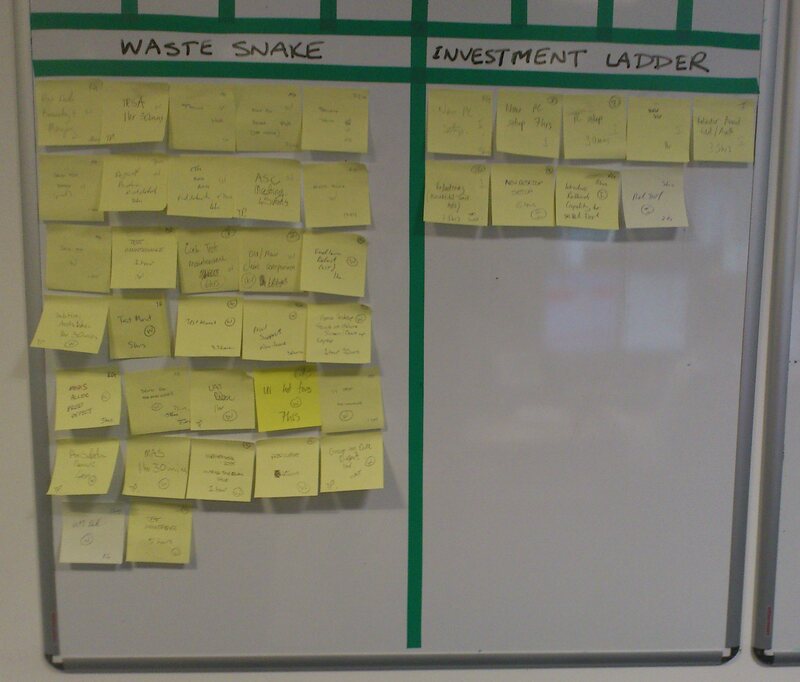 Below is one of my first Personal Kanban boards from three years ago. My wife and I were relocating from Scotland to the US and had a lot to do to make the move happen smoothly. We were figuring out how to manage the large amount of work we had to do when she asked “can’t we just use one of those board things you use at your work”. By “board thing” she meant “task board”. I had a small 1.5 x 1 foot whiteboard in my home office at the time. On this I created the TODO, DOING and DONE swim lanes using electrical tape. 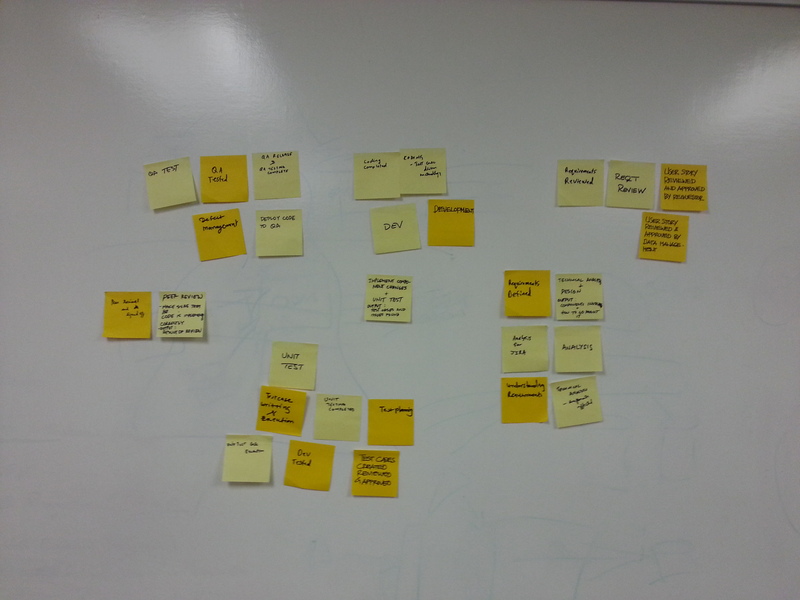 This board was way smaller than those I typically used for task boards in work but by using small (5 x 3 cm) stickies we were able to fit all of our tasks on. 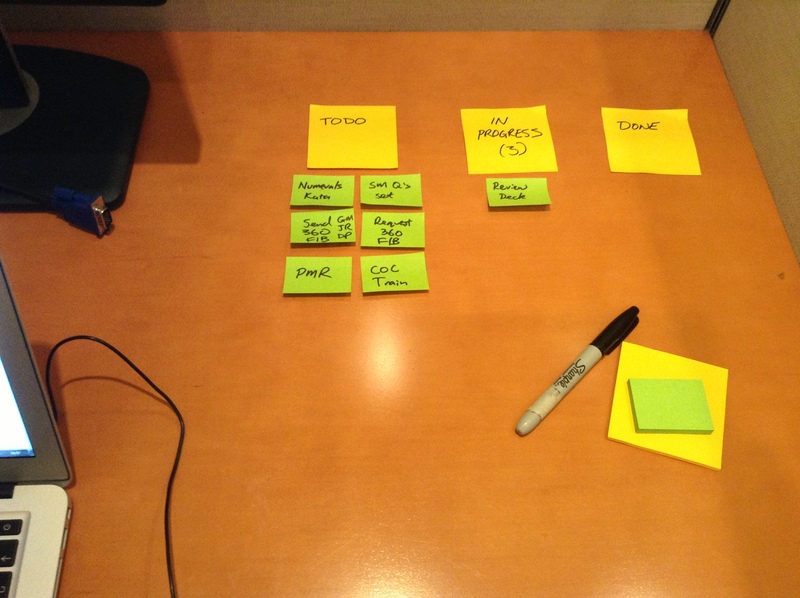 Such tiny stickies are what I have used for my Personal Kanban boards ever since. They minimise my boards’ footprint and force me to be concise with my task naming, especially if I write using a sharpie. The board worked out well. 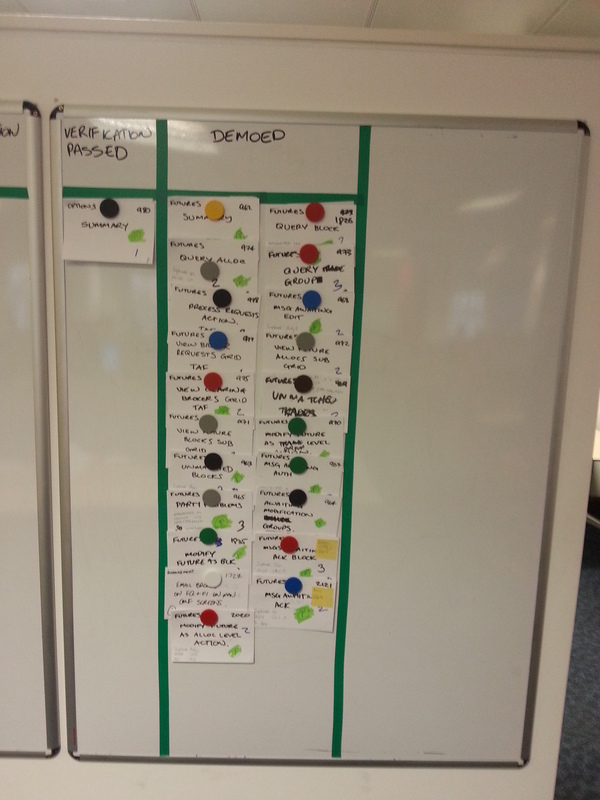 Its visual nature helped us to build a backlog, prioritise tasks easily and see where we were in the overall move process. 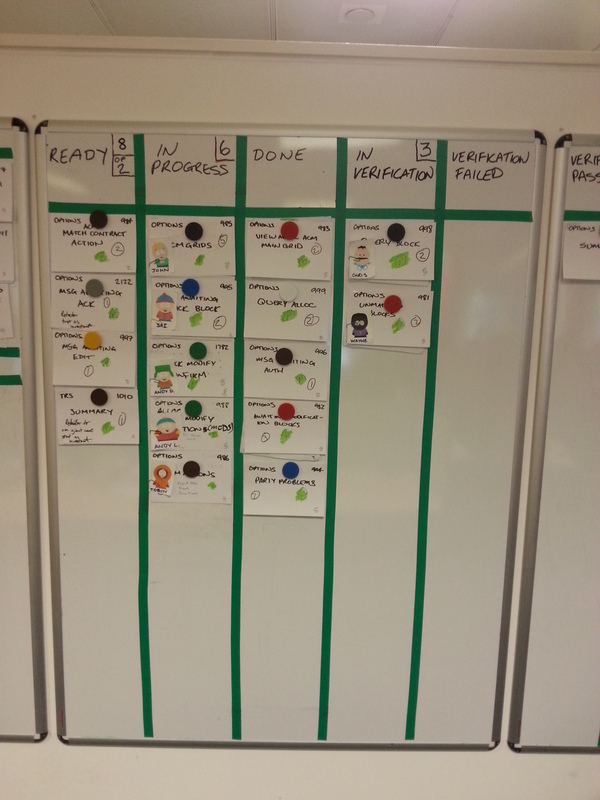 I then started using a Personal Kanban board actively in the work place. At the time this picture was taken I was in a cube in the US with nowhere to put even a small whiteboard. Undeterred I crafted the equivalent to a board on my desktop using painters tape for the swim lanes. Note the addition of the BLOCKED column which I find invaluable. 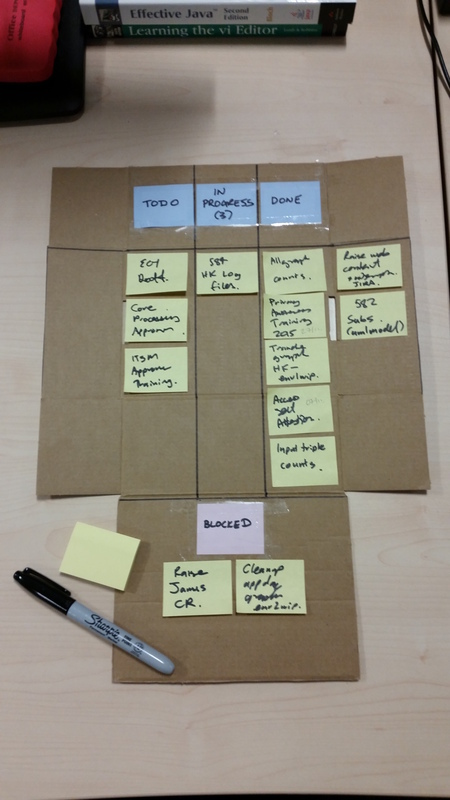 More recently, back in Scotland, I had reduced desk space so I created as minimalist a desktop Personal Kanban as I could. 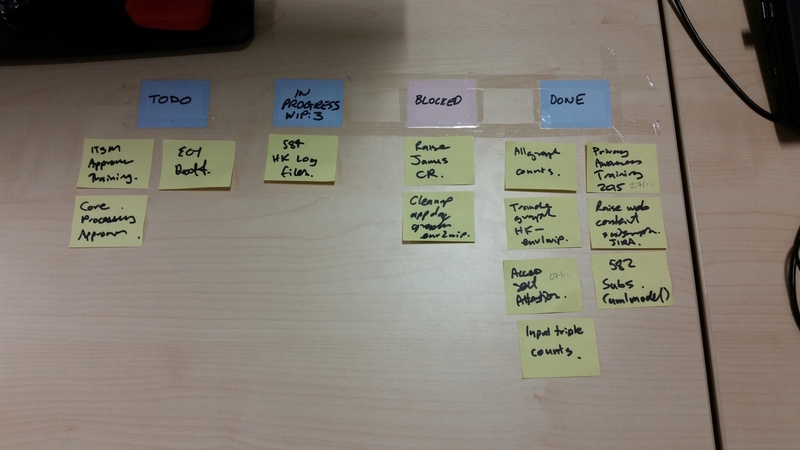 The swim lane labels are simply sellotaped to the desk with the tasks arrayed in line below. Similarly when on business trips one of the first things I do at my temporary desk is create a quick ad-hoc Personal Kanban board. All that’s required are mini stickies and a sharpie pen. Lately my employer has introduced a strict clear desk policy. It looked like my Personal Kanban board would have to go as leaving any written materials on my desk overnight, no matter how innocuous or terse, would break the rules . Instead I created a more mobile board that I could lock away in a drawer. The basis was a small cardboard box my new webcam had arrived in. I flattened it out, used a sharpie to draw on swim lanes and attached stickies with swim lane labels using sellotape. Finally I used blu tack on the underside of the board to keep it in place on my desktop during the day. 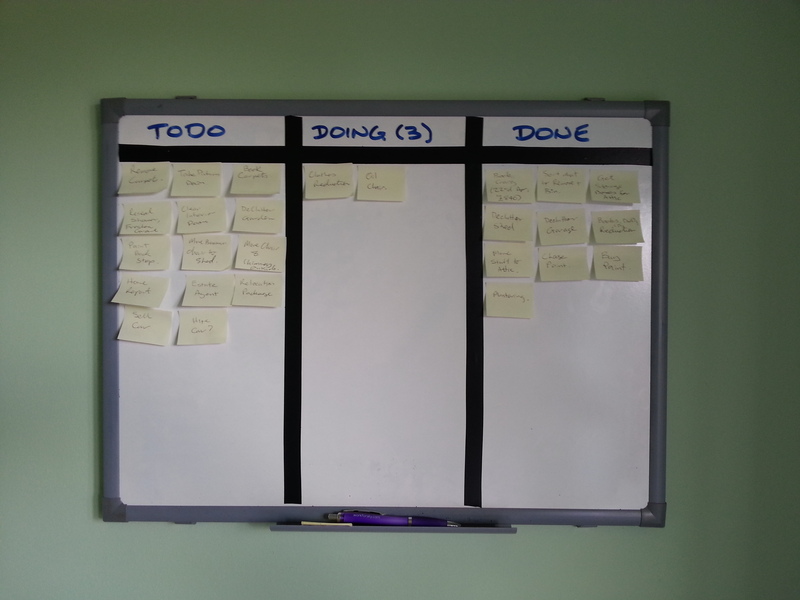 This solution works well and is my current Personal Kanban board. The bonus is that it folds up easily along the original cardboard folds. This allows me to slot it into a small envelope and take it with me when I work at home or go on business trips. 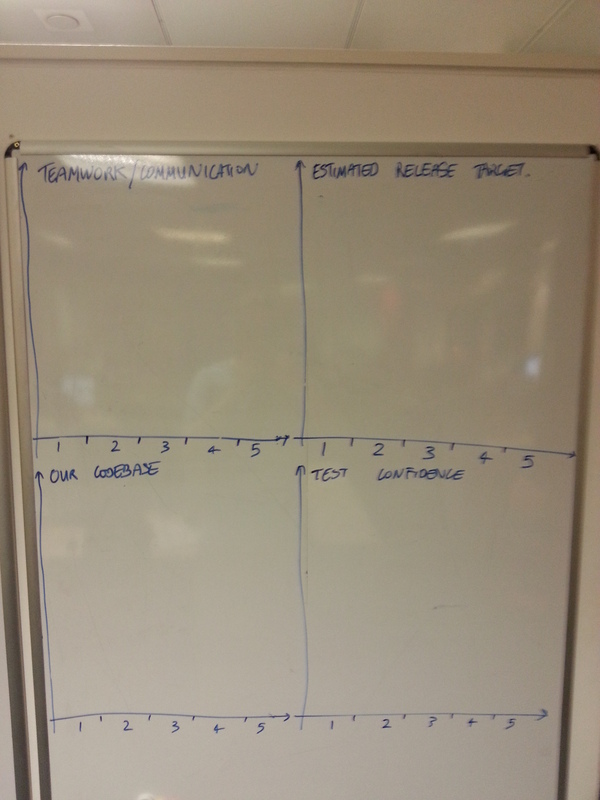 The last example board is not a Personal Kanban board but is the smallest board I have ever created. 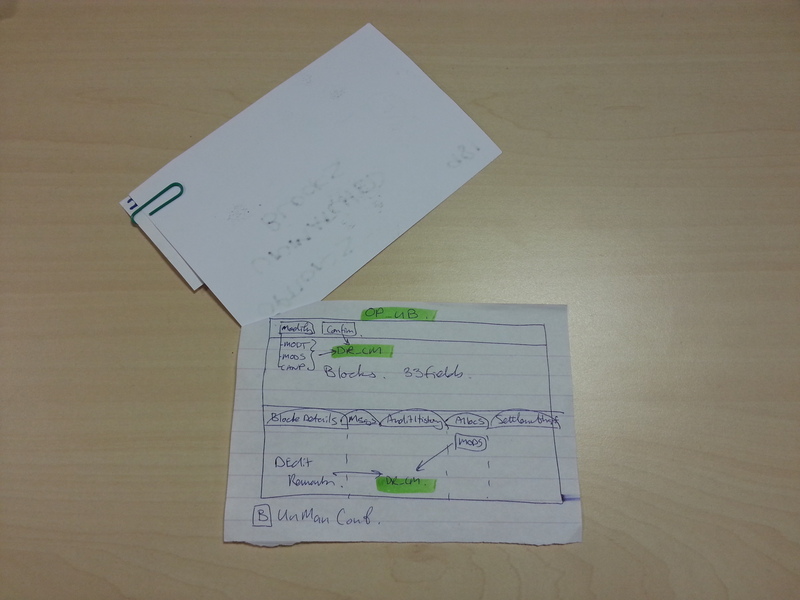 A colleague and I were the only two developers working on a web app to an aggressive timescale. 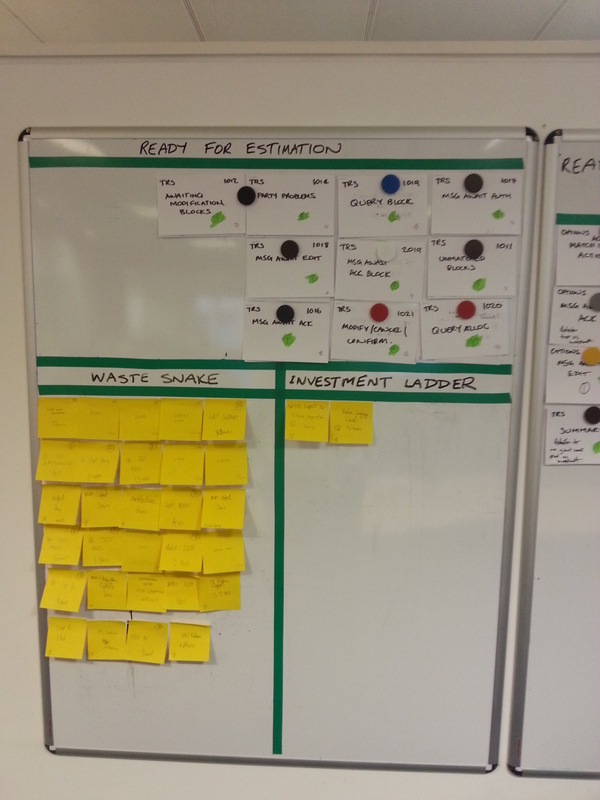 We wanted a task board to visualise the work but both had an aversion to using JIRA as an online board. Fortunately we sat next to each other separated only by a waist high partition. However, local policy forbade any whiteboards in our workspace as they were seen as being untidy. In addition, due to the partition there was nowhere to put a desktop task board where we could both see and interact with easily. 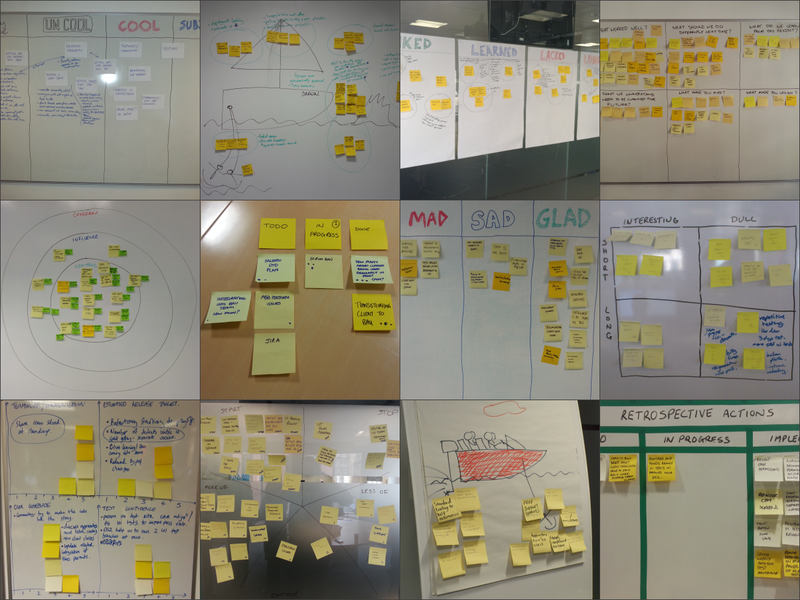 Over the last three years I have written a number of posts detailing various Sprint Retrospective techniques. Each technique’s writeup describes what it is good for, the steps to run it and includes pictures of real sessions. This post represents a roundup of all of the techniques I have written about with links to the original posts. This post presents three more sprint retrospective techniques to add to the six I have already detailed in my previous posts Sprint Retrospective Techniques 1 and Sprint Retrospectives 2. Why present three more techniques? Surely six is enough to drive continuous improvement in any team? First of all I have found these techniques to be useful additions to my arsenal for reasons I outline below. Secondly variation is one of the keys to maintaining the effectiveness of a team’s retrospectives and more techniques makes for more variety. What was Liked? 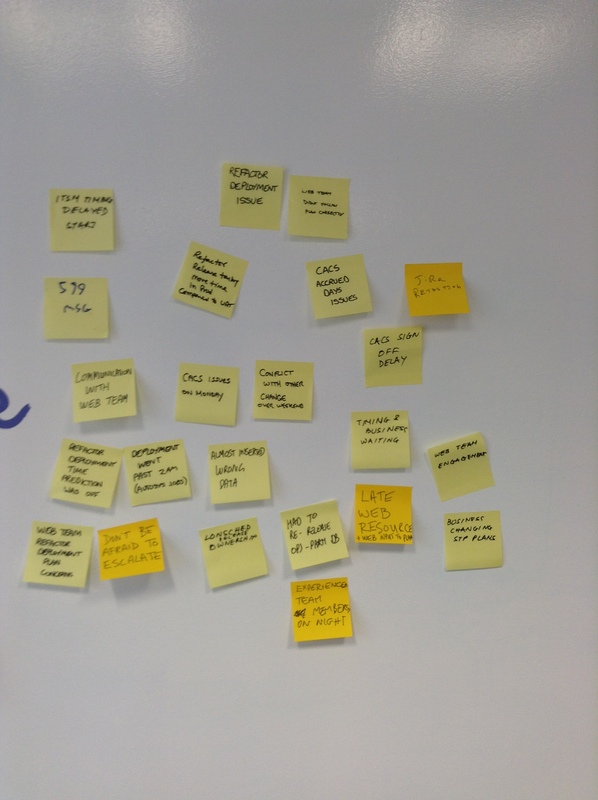 What were the things that the team really appreciated about the sprint? What was Learned? 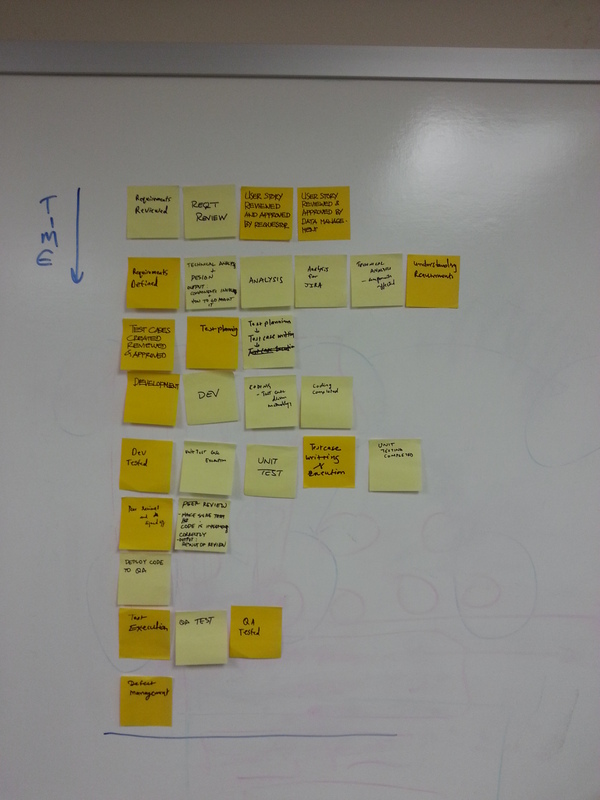 What were things that the team learned that they did not know before the sprint? What Lacked? What were the things that the team think could have done better in the sprint? What was Longed For? 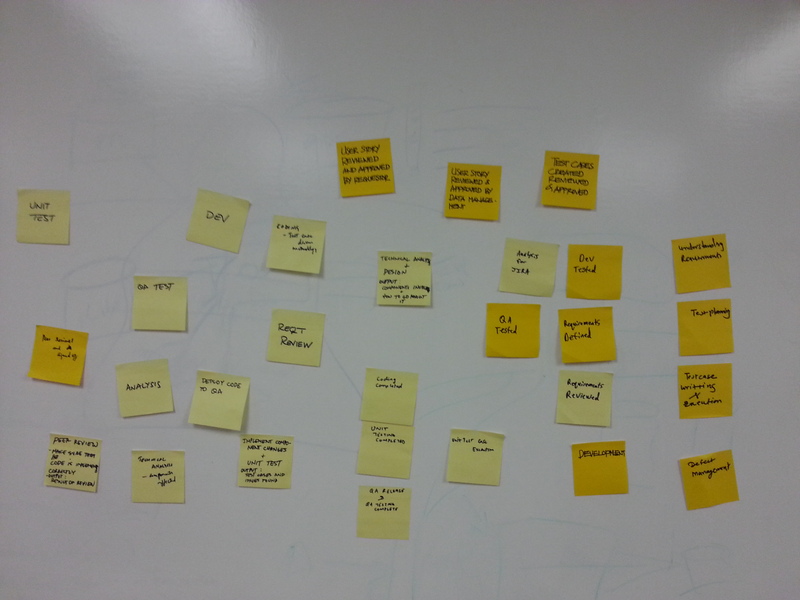 What were the things the team desired or wished for but were not present during the sprint? Create a poster for each of the Ls and stick them up on the wall (easel paper is good for this purpose but drawing sections on a whiteboard is a good alternative). Explain the meaning of each of the Ls to the team. Hand out sticky notes and markers to the team. Encourage the team to place stickies with ideas onto each relevant poster and wait until everyone has posted all of their ideas. Have the team group similar ideas together on each poster. 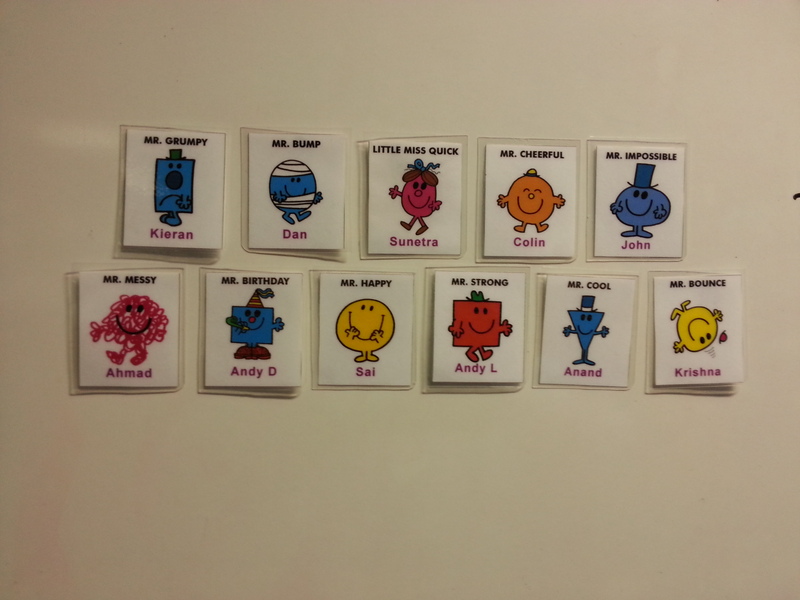 Discuss each grouping as a team and note any corrective actions. The reason I like using the 4Ls is that it has the potential to cover a wide range of topics in a compact session. 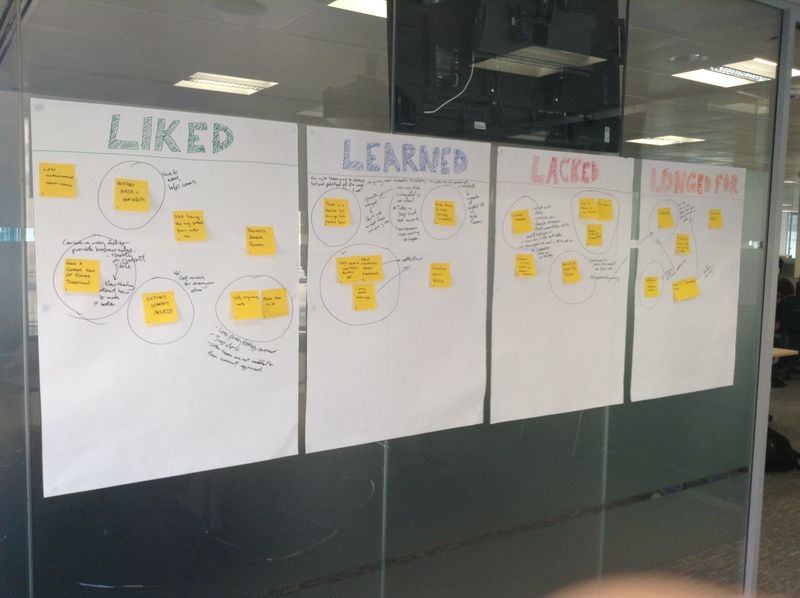 It addresses both the positive and negative aspects of the sprint (Liked and Lacked) but also specifically calls out the teams growing experience (Learned) and problematic gaps that can filled (Longed For). There are many variations of the Satisfaction Histogram. I came across the version outlined here when a team member on a project I was a Scrum Master on offered to run a couple of retrospective sessions. This is how he ran one of the sessions and it turned out to be very effective. As preparation pick around four topics that you want to gauge the teams satisfaction of. These can be practices, behaviors or anything else you can think of. For example: Testing practices, Keeping a clean build, Standup effectiveness, Accuracy of estimates, etc. Draw a satisfaction histogram for each of the topics on a whiteboard. Label the x-axis 1-5 for each and add the topic name as a heading. Explain the meaning behind each of the topics to the team. 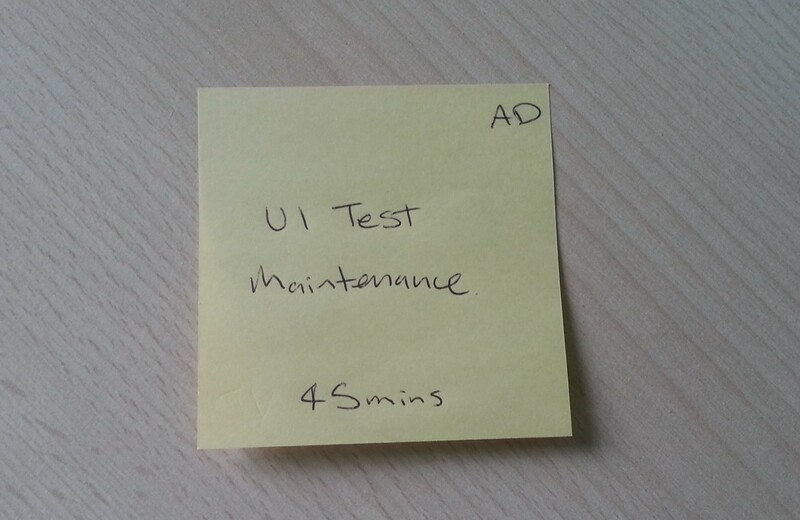 Distribute sticky notes to the team, one per topic. Invite the team to place one sticky note in each topic’s histogram to grade how satisfied they are with the team’s performance for that topic. Sticky notes placed on the same topic and number are stacked. Wait until everyone has placed their stickies. Discuss the results for each topic in turn. Where there is low satisfaction or a wide-spread of satisfaction grades dig into why this is. As potential corrective actions are identified by the team, especially for topics with mostly low numbers, note them down. This version of Satisfaction Histogram has a number of advantages. First of all the selection of topics means that it can be targeted to certain problem areas. Note that the technique can also be varied to allow the team to suggest topics. 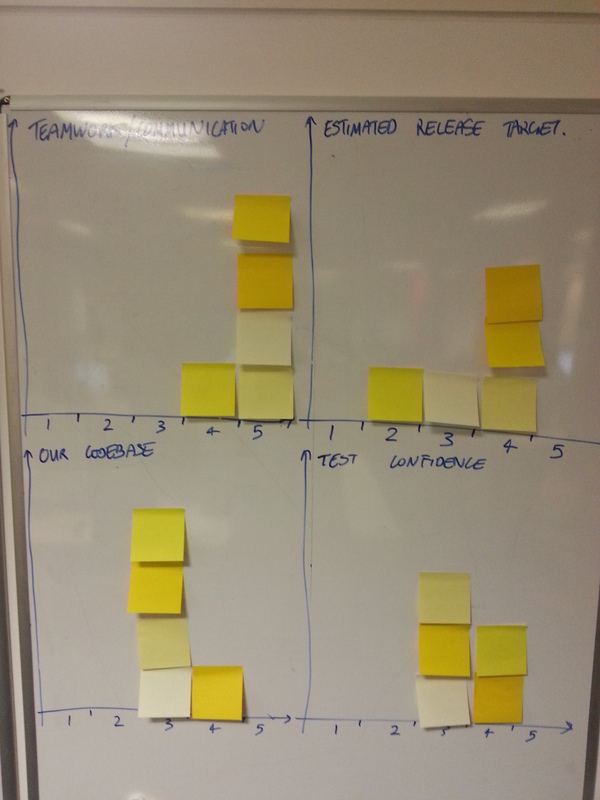 This can be done by leaving one histogram blank for the team to suggest the topic during the session. As the team becomes more familiar with the technique you can allow them to suggest all of the topics to be scored for satisfaction. Secondly it is very visual. 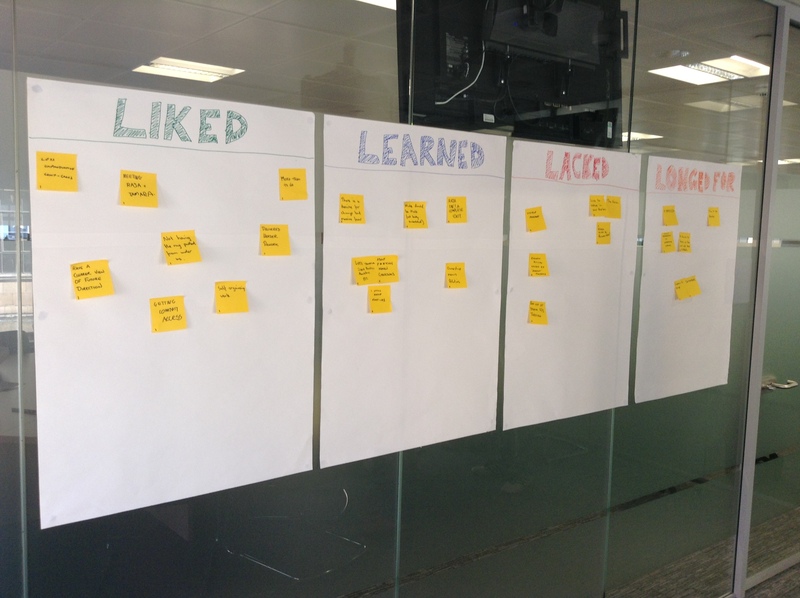 At a glance everyone can see the topics where the team is satisfied, dissatisfied or in disagreement. This allows the team to focus on the topics where they belive they are most lacking or conflicted about. Circles is more commonly known as Circles and Soup. I dislike the “Soup” metaphor so I refer to the technique simply as Circles. In addition when I run this technique I replace “Soup” with “Concern”. I understand that the technique is based on Stephen Covey’s book Seven Habits of Highly Effective People. 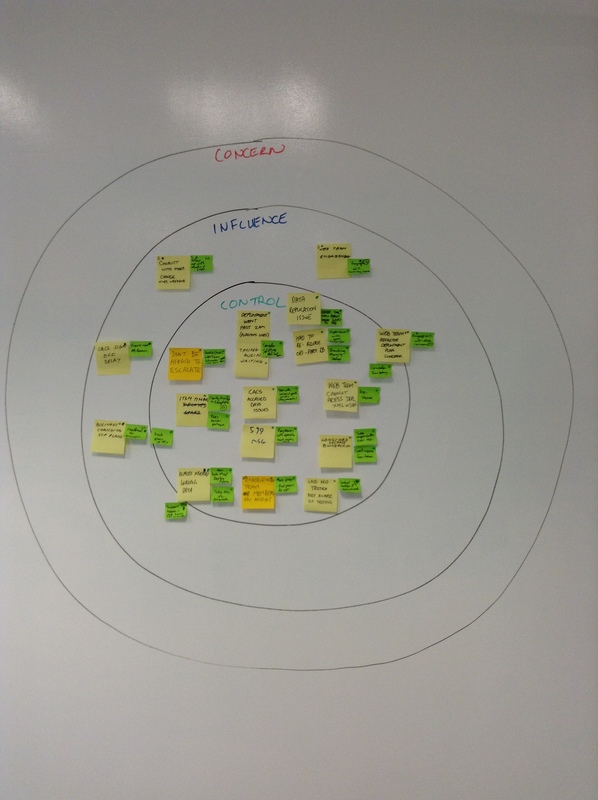 The idea behind circles is to get the team to focus their energies on what they can change and not to waste time worrying about what they cannot affect. Distribute sticky notes and markers to the team. 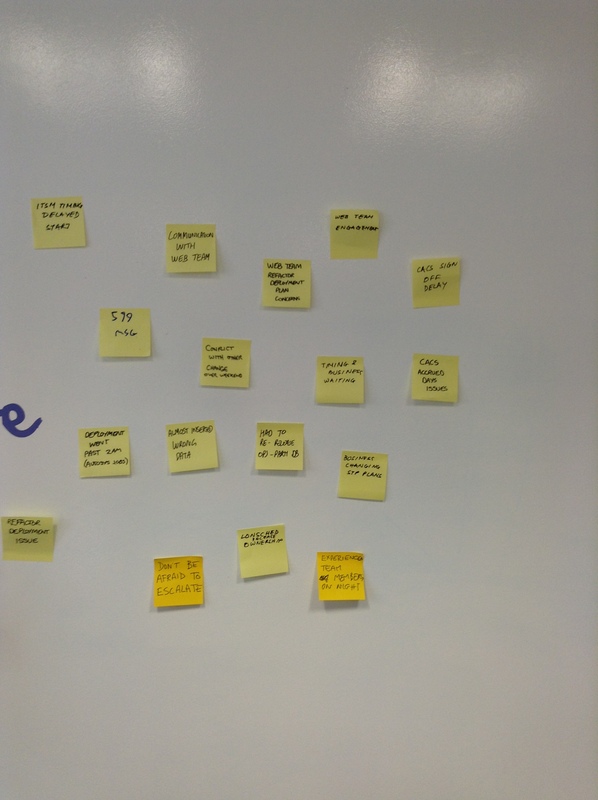 Ask the team to write down all of the impediments encountered in the sprint, one per sticky note, and have them post them onto a whiteboard. Wait until everyone has posted all of their impediment ideas. 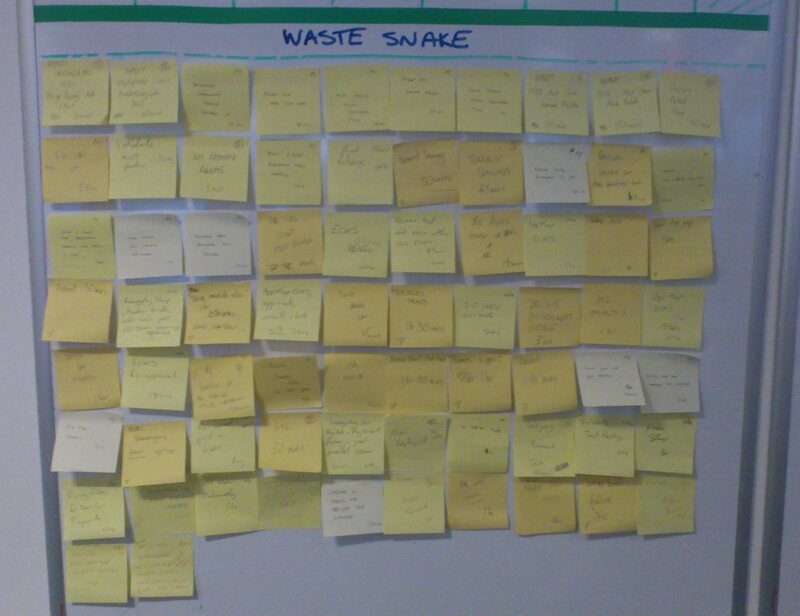 Ask the team to identify and remove any duplicate impediment stickies. 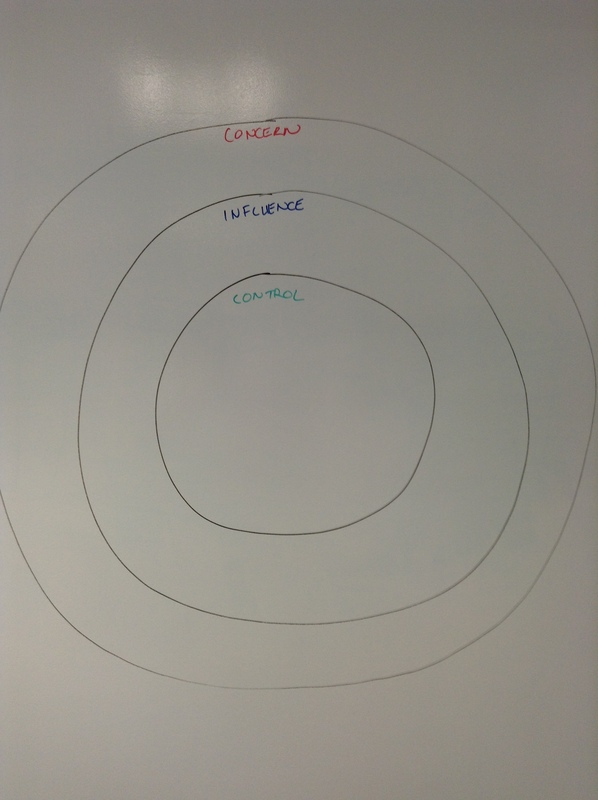 Draw three concentric circles on the whiteboard and label them, from the inside out, “Control”, “Influence” and “Concern”. Control – Impediments for which the team can take action to remediate. Influence – Impediments for which the team can collaborate with or make a recommendation to an outside entity to remediate. For example, another team, group or line management. Concern – Impediments over which the team has no ability to Control or Influence. 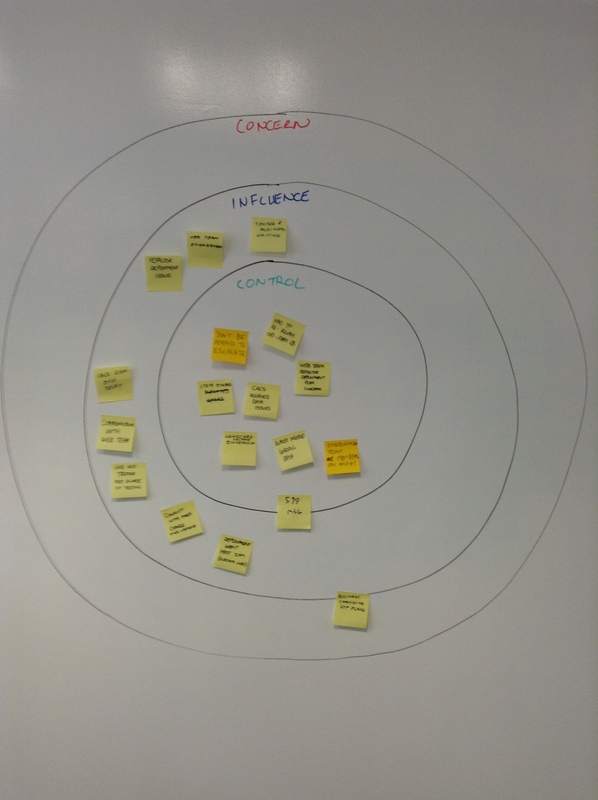 Invite the team to collaboratively place each of the impediments in the appropriate circle. Encourage and guide any debate as to what should go where. Wait until all of the impediments have been placed in one of the circles. Gain an understanding of what each impediment is. 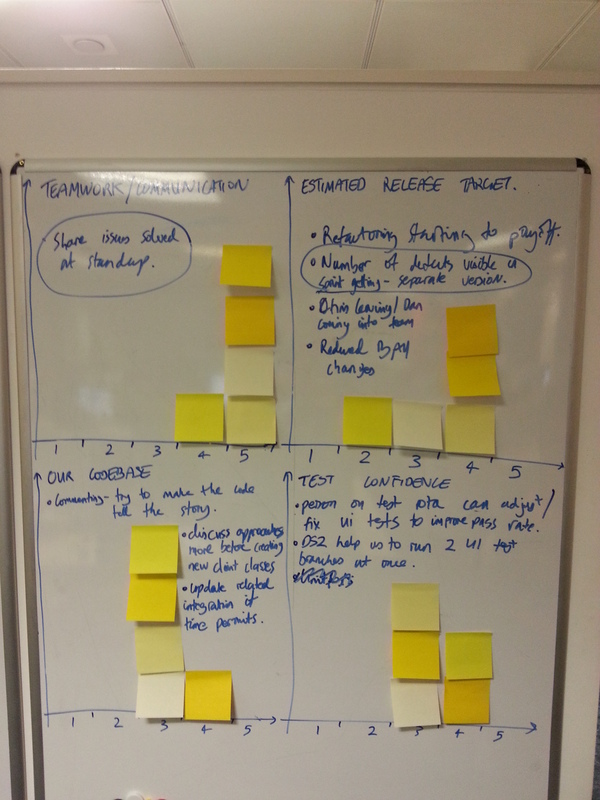 Identify remedial actions that are within the team’s control and write these on the whiteboard. 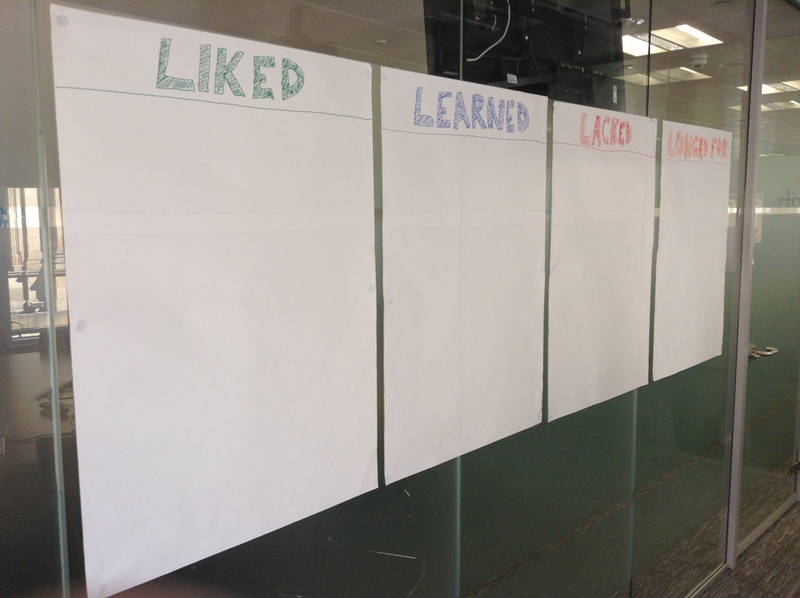 Identify contacts and recommendations to influence their remediation and write these on the whiteboard. Review the Concern impediments to gain an understanding of what they are. Note that as the impediments are discussed the team may identify actions that had not previously occurred to them. This can cause the impediments to move inward. For example an impediment that was initially placed in Concern may move to Influence or Control. Circles is my new favourite technique but I use it sparingly. The reason I try not to overuse it is because it focuses very much on impediments and does not have the “celebration of success” aspect that is built into most other retrospective techniques. However, it is a powerful technique for sprint retrospectives as well as for other purposes. It is, for example, ideally suited to holding retrospectives into releases especially those that proved to be problematic. A few months ago I underwent a career change by converting from being a Scrum Master to an Agile Coach. I am still adjusting to my new role but am, by and large, enjoying the challenge and change of pace that it entails. I work with a number of internal teams which represent a fairly broad spectrum of Agile experience from novice to intermediate. When I engage with a team for the first time I ask them a number of initial questions to help me to gauge their Agile maturity. Some of these concern the Agile ceremonies they practice and the particular Agile artifacts they make use of. 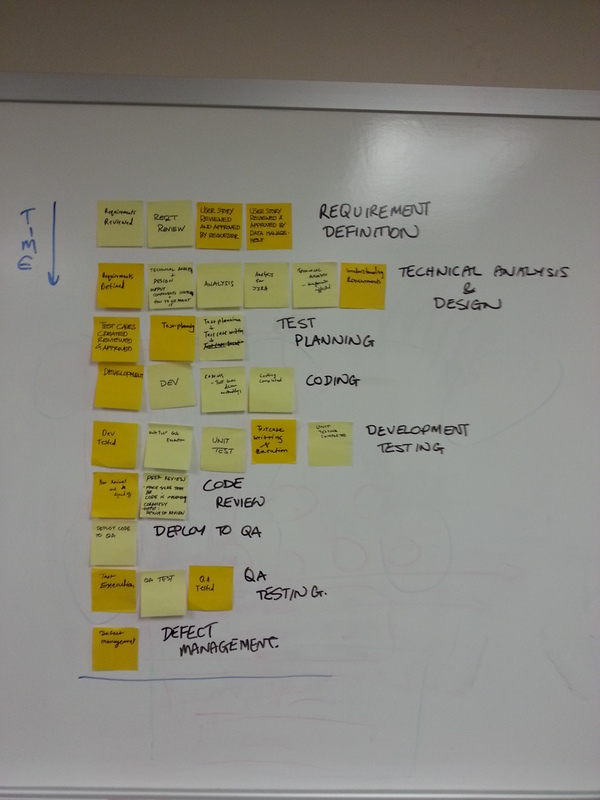 What has surprised me so far is that an overwhelming number of these Agile teams did not have a Definition of Done. For those not familiar with what a Definition of Done (DoD) is I will attempt to summarise the concept here. 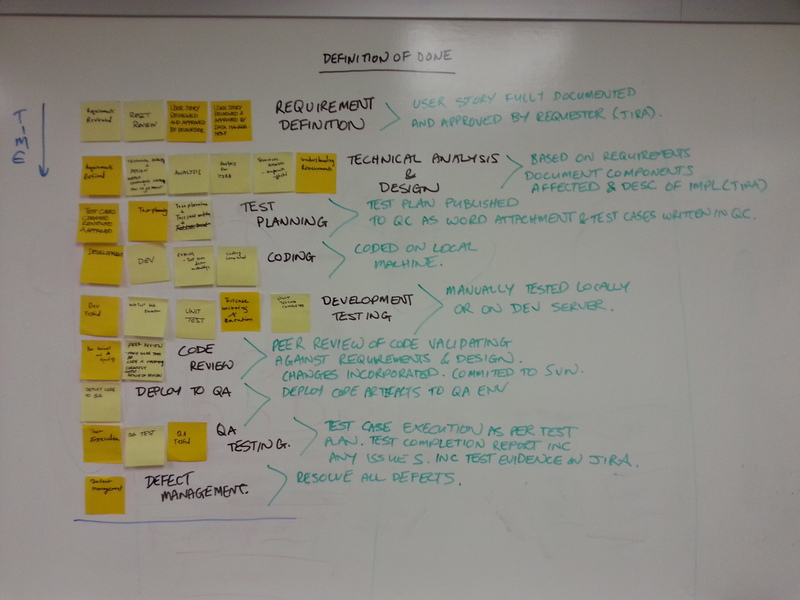 A DoD is a checklist of useful activities that are carried out by a software team every time they implement a user story. The DoD can, for example, include things like ‘Code’, ‘Unit Test’, ‘Integration Test’, ‘Peer Review’, etc. The idea is that the culmination of all of these activities against a given set of requirements will result in potentially releasable software. That is quality software that satisfies the requirements. Until all of these activities are completed successfully for a given user story it cannot therefore be considered ‘Done’. It is important to note that every team’s DoD will almost certainly contain different activities because they do different types of work and have different means of ensuring quality. Therefore every team has to spend some time coming up with their particular DoD. For Agile teams an agreed and published DoD is essential as it brings transparency to a team’s way of working. Firstly it helps to ensure that everyone on the team is on the same page as to what “Done” means and how they should get there. Secondly as the DoD is written down it can be discussed and subsequently altered as the team agree to make changes to how they work to improve quality and efficiency. For example, via their retrospectives. Some of the teams I coach had not heard of a DoD. Some had but had not written theirs down. However, they insisted that they knew what it was. As an experiment I asked several members of the same team what they thought their team’s DoD was. I got back as many different answers as the number of team members I asked. Although the teams thought they had a shared idea of their DoD they did not. As a result of these findings I have been on a DoD offensive of late. This has involved explaining the benefits of having a DoD and helping teams to get their initial DoD published. 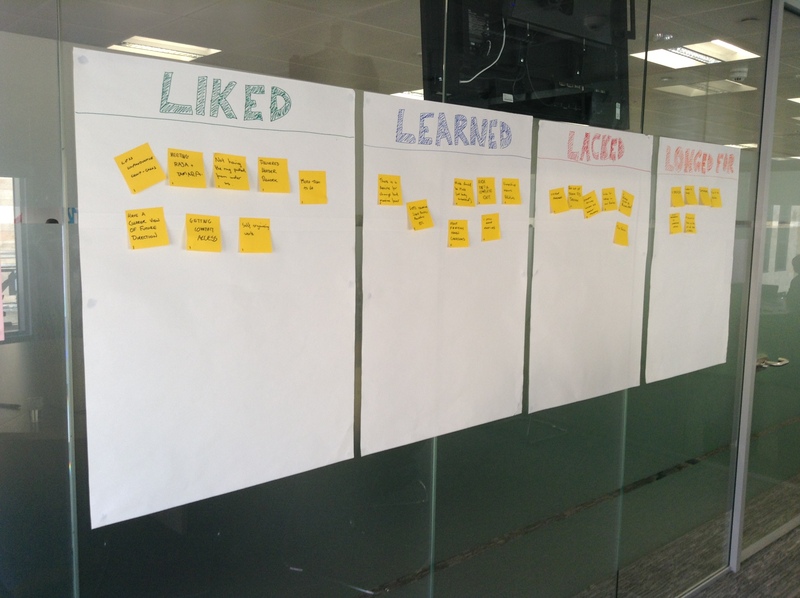 I have helped so many teams define these recently that I have come up with a workshop format to help drive them out. I present the outline of this DoD Workshop format in this post. The workshop is designed to be run in-person and ideally the entire team should be present. When not all of the team members can attend and the team is not cross-functional then all functions should be represented. No specific preparation is required on the part of the team. I allow an hour for the workshop and hold it in a room with a white board or similar usable wall space. I start by explaining what the session is about, i.e. creating the team’s DoD which will subsequently be published on their wiki. This of course involves explaining what a DoD is and how it can help the team. This normally raises a few questions from the team and I address these before moving onto the next stage of the workshop. Next I hand out sticky notes and sharpies. I request that the team think of all of the high-level activities that they normally engage in to get a story done. I ask them to write each of these items onto the sticky notes with one activity featured on each sticky note. I insist that everyone writes up at least a few sticky notes and that they only include the activities that they do now not things they would ideally do in the future. Once everyone has finished writing I get the team to post all of their items, in no particular arrangement, onto the white board. Next I ask the team to collaboratively group similar and identical items together. Team members may have used different terminology to describe an otherwise identical activity but by working together they can identify which stickies are actually the same thing. With the groupings complete we go through each one and validate all of the items within it are truly the same activity. I also check that the team actually does the particular activity now and that it is not simply an aspiration. Any such aspirational items are removed. Next I work with the team to place each activity group into a timeline. The placement of the activities reflects the order in which each takes place within the team’s development process. With the timeline in place we now turn attention to creating a headline name for each activity. 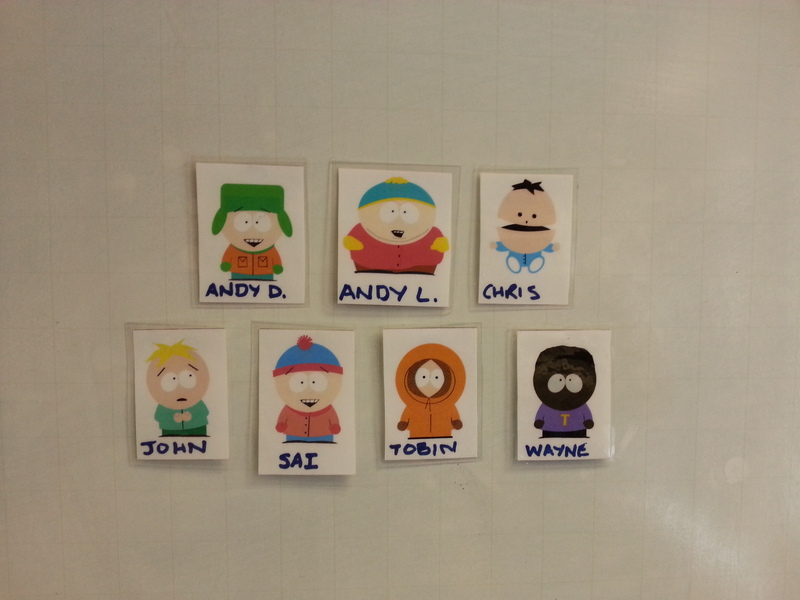 This is necessary because individual team members may refer to the same activity by a different name. For example, “Implementation”, “Coding” and “Development” are all different terms for the same things. Having the team agree on a single name for each activity introduces a consistent terminology that the team can use to enhance their communication when discussing their DoD. In addition if a team struggle to create a headline name for one of their activity groups then it suggests that it may need to be broken up into several more nameable activities. The agreed headline names are written against each activity. With the headline names agreed I go through each activity again. This time I ask the team to define what is involved in accomplishing each of them focusing on the deliverables, outcomes and conditions that represent success. These descriptions are written against each activity beside the headline name. The combination of the ordered activities and the more detailed descriptions represent the team’s DoD. Finally I snap a picture of the board and collaborate with the Scrum Master to have it documented in the team’s wiki and communicated out to the team. If possible I also recommend that a paper copy be posted somewhere in the team’s physical work area. Note my insistence throughout the process of only including the things the team does now. This may seem overly constraining when the team could be suggesting good adaptions. However, the main purpose of the exercise is to capture what the team does now. Immediately after the DoD is agreed and published the team is free to discuss it and make positive changes. This may even happen in a separate, later section of the workshop. The key is to write it down first, warts and all, so that the team’s improvements can be made against a known state. So far I have only used this workshop format to help document the DoD for teams that are already sprinting. However, new teams should not wait until they are partway through a project before they create their DoD. They should instead put it in writing at the very beginning. I envisage that this workshop format could be used equally as effectively to create the initial DoD for a newly formed team. The only difference would be to have the team write-up stickies for the activities they think they will need based on their previous experience. Otherwise the session could be run in much the same way. A month ago I relocated from Scotland to the US. 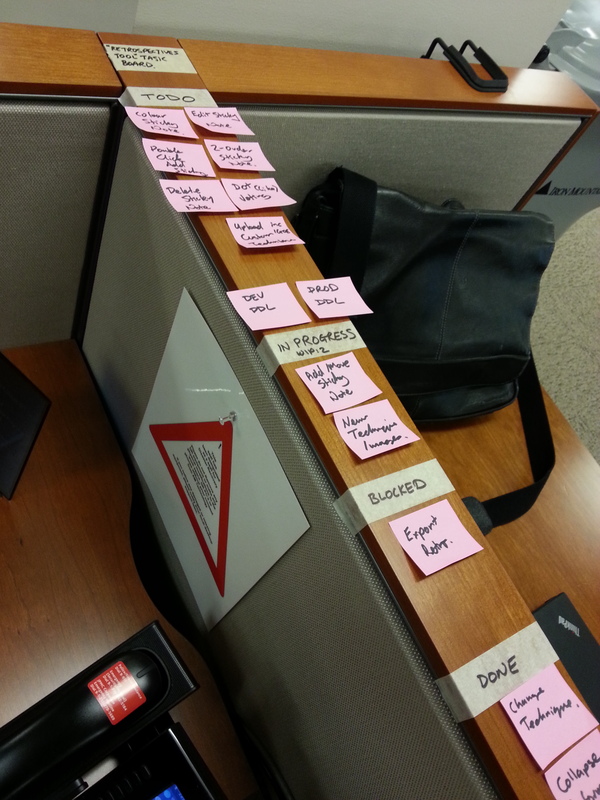 This move necessitated a lot of planning (and heavy use of more than one personal Kanban board). Many decisions had to be made. In particular I had to decide what to take with me and what to leave behind. One of the things I decided to leave behind was my rather voluminous Agile Kit. Everything in the kit has its use but it wasn’t going to fit in my luggage. Also by the time the main shipment of my belongings travelled between Scotland and the US I would have had to replace most of it anyway. I therefore gave away most of the kit to my local Scrum Master colleagues. I say I gave away most of the kit because I would need a couple of materials to hand from day one of my move to help me facilitate planning and retrospective sessions in my new workplace. I decided to have a little fun with the exercise and brand my mini Agile kit. I have an unhealthy fascination with weird reality shows. One of the shows I watch is Doomsday Preppers. Preppers are survivalists who prepare for extreme, sometimes civilisation ending, events. One thing preppers have constantly to hand is a bug out bag. This contains everything a prepper needs to survive for a few days should the worst happen and they need to get out of dodge fast. 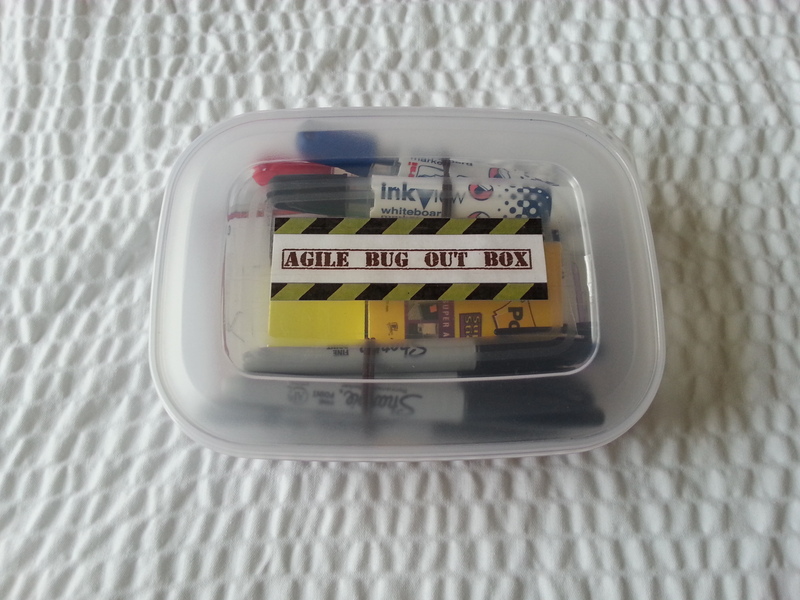 Stretching the analogy more than a little I decided to create a prepper styled Agile Bug Out Box. I chose a box rather than a bag as it would protect its contents better and I liked the look of Corinna Baldauf’s Scrum Master Emergency Kit which also takes the form of a box. The box would contain everything I would need to perform my agile role for a few weeks. 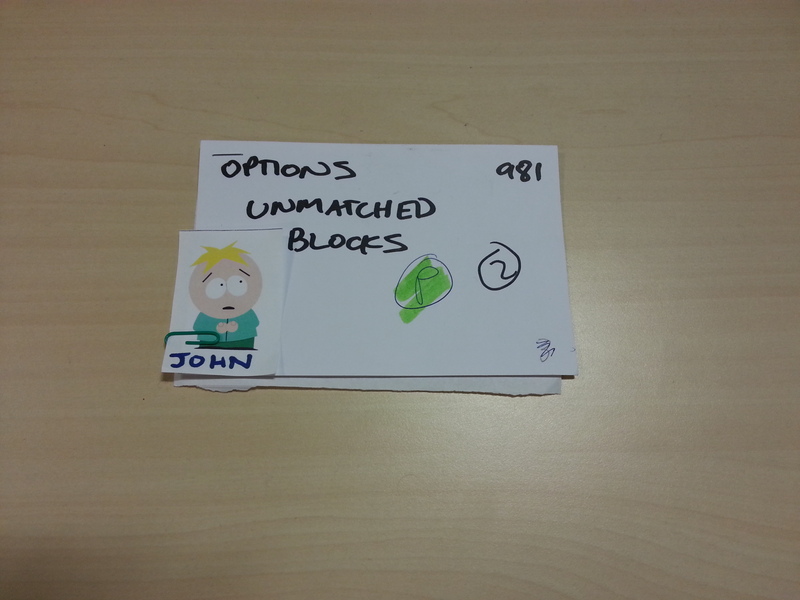 My custom planning poker cards. Four whiteboard markers, each a different colour. So why did I settle on these particular items? One of the planning techniques I use is planning poker so I needed a deck to do that. While I gave away all my other official decks I couldn’t part with my custom hand-made deck or risk them to surface transit. The super stickies, white board markers and sharpies are essential for me so that I can run retrospectives. Every technique I currently perform utilises some or all of these items. 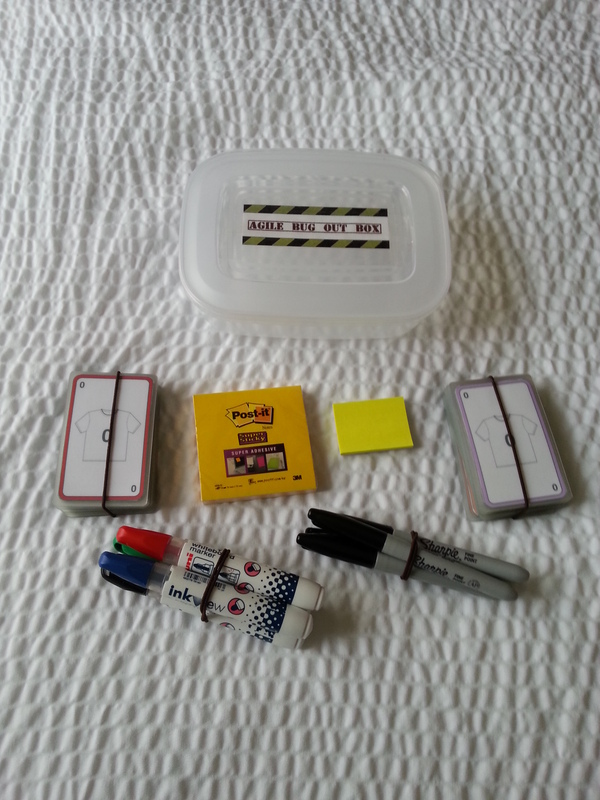 I have been in the US for four weeks now and my Agile Bug Out Box has proved to be invaluable. However, there is a Staples store just over the road from my office so I will start building up a full agile kit again soon. I’ll keep my Agile Bug Out Box to hand though. After all you never know when you’ll need to bug out.